A Deputy who saved a choking teacher, received a star Valor For Saving Life. A quick-thinking sheriff's deputy who was caught on camera saving the life of a choking teacher, has received the highest honor awarded by his Louisiana sheriff's department. On her first day on the job, Lindsay Burns, a teacher at Plantation Park Elementary School’s kindergarten in Louisiana, was a bit hungry, so she went to grab a snack while her students were engaged in their own activities. She took a bite of fruit. Then things went horribly wrong. “When I took a bite, it immediately just slipped down into my throat,” Burns said in a police report. (Bossier Parish Sheriff's Office) Bossier Sheriff Julian Whittington presented Deputy Slopak with the "Star of Valor" award to a packed-out gymnasium on the campus of the Plantation Park Elementary School in Bossier City, Aug. 20, 2018. Unable to breathe, Burns tried to wash to piece of fruit down her throat with water -- but that only made things worse. Lindsay told Bossier Parish Sheriff's Office that she was not be able to breath for a short time, and she thought that water would help push the fruit down her throat. Burns was in panic, but she did not want to scare the students, so she ran from the classroom for help. Meanwhile, Bossier sheriff's deputy and new school safety officer Chris Slopak, was returning to the school after patrolling the parking lot when he spotted Burns choking. The video shows Slopak repeatedly performing the Heimlich maneuver on Burns, for a full 20 seconds before he was able to expel the food from her windpipe. 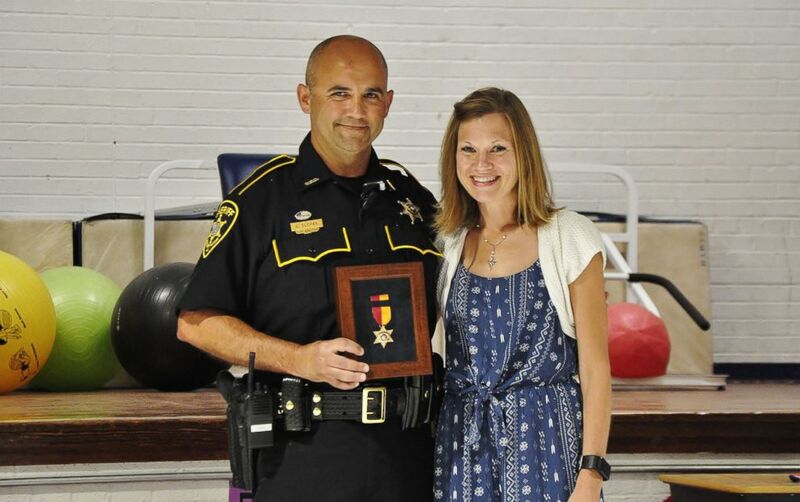 (Bossier Parish Sheriff's Office) Bossier Parish Sheriff's Deputy Chris Slopak receives the "Star of Valor" award for saving the life of the Plantation Park Elementary School teacher Lindsay Burns on Aug. 20, 2018. “I was just in the right place at the right time,” Slopak told ABC News over the phone. Slopak said that due to his training, he simply snapped into action. “Once I had established with her that she was choking, I just went straight into trying to dislodge the food,” he said. Burns said she owes her life to Slopak's rapid response. 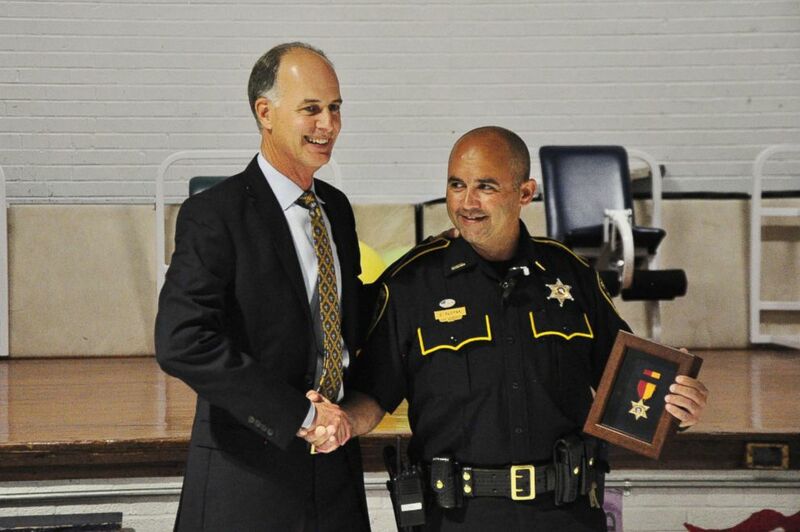 In an August 20 ceremony at the school, Bossier Parish Sheriff Julian Whittington presented Slopak with the Star of Valor award, according to Bill Davis, the public information officer for the sheriff's office. “This award is the highest one that the sheriff presents,” Davis said. Asked if he accepted that he is a ‘hero’, Slopak said simply that he was just did the job as he has been trained for by his department. “No I'm not a hero," he insisted. "You know these are scenarios that we've been trained for,” Slopak told ABC News. “I was just in the right place at the right time, and I was just happy that I was there just to be able to help her,” he said.